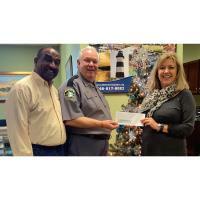 The Little River Chamber of Commerce & Visitors Center formally thanked the Horry County Police Department for their support of the Little River community with a donation to their “Shop with a Cop” program. Our Horry County Police Officers serve both the World Famous Blue Crab Festival and the Little River ShrimpFest and protect Little River and its surrounding areas 24/7 and 365 days a year. The Little River Chamber of Commerce is a membership organization supported by more than 300 businesses and nonprofit organizations. These organizations, and the individuals representing them, join together for the purpose of promoting the civic and economic progress of our community. The Little River area's economic success and quality of life is directly impacted by the work the chamber performs, and unlike most chambers nationwide, the Little River Chamber of Commerce & Visitor's Center administers local necessities in the absence of a local municipality.